Jaguar Skills first burst onto the scene with his extraordinary DJ skills and unique ability to produce awe-inspiring mixtapes. Such originality and skill, both inside and outside the DJ booth, did not go unnoticed and it wasn't long before the world-famous BBC Radio 1 snapped up Jaguar Skills for a quarterly 'In New DJs we Trust' slot. He was given free reign to deliver his high octane mixes that involved an aural assault of every tempo imaginable, from House to Dubstep through to Drum & Bass with everything inbetween. Between 2009 and 2011, as news spread of the Radio 1 mixologist's immense skills, and with numerous sold-out UK tours under his belt, Jaguar Skills was further propelled into the global spotlight, playing at a numerous prestigious clubs and festivals both in the UK (Fabric, Glastonbury, Bestival) and Worldwide (Amnesia Ibiza, Air Tokyo, Global Gathering Russia, Nocturnal Festival USA). 2011 also saw Jaguar Skills enter the commercial domain with two particularly exciting projects. Firstly, Urban Outfitters commissioned Jaguar Skills to create his own exclusive range of merchandise packs which were available in-stores nationwide. Secondly, Jag was commissioned by drinks super-brand Carling to create an original musical production for the 'Carling Zest' online campaign. 2011 continued to be a landmark year for Jaguar Skills as it saw him release his first major compilation album on Toolroom Records. The 'Toolroom Knights Mixed by Jaguar Skills' CD, received widespread critical acclaim and cemented his place as 'King of the Mash-ups'. 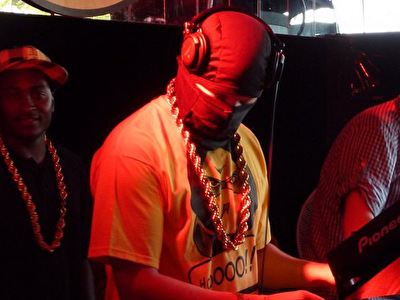 With spectacular sold-out UK and US tours already completed, 2012 is shaping up to be another mammoth year for Radio 1's masked Ninja. In the pipe-line is his second compilation this time for the mighty Ministry of Sound. This is coupled with another busy summer of touring the world's biggest and best festivals such as Wireless, Lovebox and Creamfields. Notably Jaguar Skills is joint headlining Reading and Leeds dance stages this summer and is also continuing his long-standing relationship with Bestival…this year Rob da Bank has invited the original ninja back for an unprecedented take-over of the Bollywood tent, where Jag has free reign to curate the line-up. With Jaguar Skills plotting even bigger and better plans for 2013 in his ninja-DJ-lab, stay tuned….